If you’ve been following me for a while, you know that TROT (Thoroughbred Retirement of Tampa) is one of my favorite Thoroughbred rehoming and rehabbing groups. Working directly with Tampa Bay Downs, they have helped many, many Thoroughbreds find new homes, whether it’s a life-time of pasture or a new showing career. They’ve even been there for Bon Appeal’s half-brother, Mambo Appeal, who shares her squiggle of a stripe and sleek build. When a couple of my friends from TROT reached out to me about Curragh Mon, it really touched my heart. I don’t have a lot of opportunities to write about OTTBs these days; I am spending most of my time in my cave of an office, writing fiction, and the racetrack in New York is a very expensive train ride away. I’m busy, and it’s hard to keep up. But when someone needs help, I hope I can say I’ve been there for them. Or him. Curragh Mon. Curragh Mon’s story is living proof that it can happen to anyone (I’m starting to think it does happen to everyone at some point in their fifteen to forty years on the planet — horses just don’t have good luck in our society). It can even happen to tall, well-bred dapple grays: the ones that people are supposed to swoon for, the ones that are supposed to be the most desirable. We all of us, at one point in our horse-crazy lives, have day-dreamed about a tall dapple gray. You have, and I have, and that’s just how it is. There’s something about them. But that something, and all those daydreams, aren’t enough when the horse is in the wrong hands and falling off the radar. And it’s so, so easy for a horse to fall off the radar. There’s no vetting process for horse owners, or even for horse trainers. Should there be? I’m really starting to think so. This is Curragh Mon’s story. He was lost, and he’s been found. It took hard work and it took dedication and it took love and compassion. Thanks to TROT for telling me about it and linking me to this impressive press release. Take a read, and take a think, and hug your horse, and if you can share this story, or throw a few bucks Curragh Mon’s way, do so. And maybe, down the road, let’s talk about how we’re going to stop horses from falling off the radar. Arriving with just a halter fit for a pony, this 17 hand Thoroughbred was on his way to a better life. The only memory of his racing days is the one front shoe that remains on his overgrown hooves. The transport driver said, “He just wants someone to love him”, and he was right. On Curragh Mon’s first leg of his long, bumpy road to retirement, this gray gelding seems to know his life was worth saving. Now, Thoroughbred Retirement of Tampa, Inc. (also known as TROT) is appealing to horse lovers and racing fans to assist in funding Curragh Mon’s transition to life away from the track. Curragh Mon’s racing career began full of promise, when he rallied to finish second in a Tampa Bay Downs maiden special weight race for 3-year-olds in his January 2009 debut. He broke his maiden eleven months later at Tampa Bay Downs and went on to win three more times. The striking gray/roan son of Maria’s Mon — sire of Kentucky Derby winners Monarchos and Super Saver — appeared to have an extremely bright future. However, the trips to the winner’s circle were few and far between and he changed owners seven times over four years of racing. His last three starts were in March and April of this year at Fonner Park in Grand Island Nebraska. After that, he fell off the radar. Fortunately for Curragh Mon, organizations such as TROT, a nonprofit organization dedicated to the safe retirement from racing, retraining and rehoming of Tampa’s racing Thoroughbreds, have taken the lead in an effort to ensure that Thoroughbreds have a chance to lead happy and productive lives after their racing careers are over. After locating Curragh Mon through painstaking diligence, TROT is bringing him back to the Tampa Bay area to begin his well-deserved retirement. The horse’s former owners contacted TROT board member Vanessa Nye as they were concerned about what happened to the horse. Nye, a Tampa attorney who owns and operates Voodoomon Stable, is a strong advocate of safe retirement and aftercare for Thoroughbreds. Nye made scores of telephone calls in her quest, enlisting the aid of numerous horsemen. On May 9, she found out that his last racing owner had given Curragh Mon away. It took another five weeks to finally locate the horse, which had changed hands and for possible use in unregulated match racing. Finally, they were able to contact the individual possessing Curragh Mon, who agreed to sell him for $2,500, an amount Nye agreed to pay along with shipping costs. Nye said Steve Breen helped with coordinating his return home and the horse’s former owners are chipping in to cover the expenses. No one can say for certain what Curragh Mon’s fate would have been had not Nye and her contacts put in the hours and diligence to launch the process of tracking him down. “It took me eight weeks and about 400 phone calls, but I was very determined,” she added. Curragh Mon is scheduled to return by van to TROT’s foster facility in Myakka City in the next few weeks. “Really, TROT is full to capacity, but we don’t want to turn away a horse that has raced at Tampa Bay Downs. We (racing owners) all have to become more conscientious and investigate who we give these horses away to,” Nye said. TROT estimates it will take at least a month for Curragh Mon to wind down from racing before starting retraining and being available for adoption. TROT is seeking donations to support him and the other fourteen horses currently in the program and available for new careers or as loving companions. 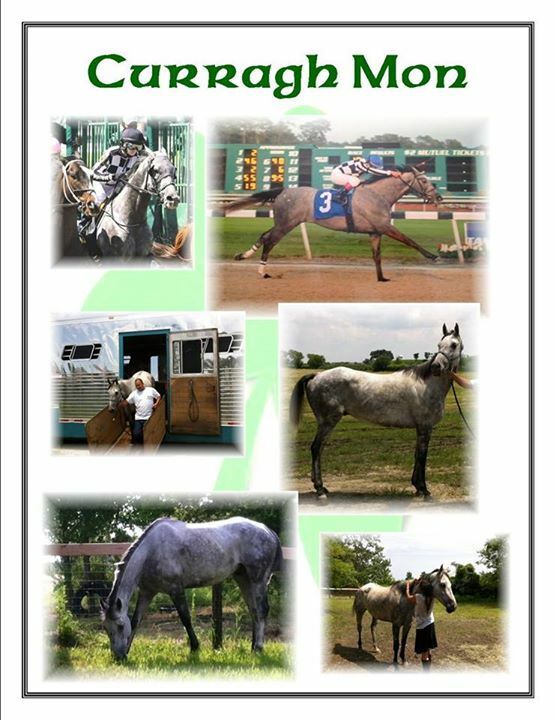 Please consider making a donation to Curragh Mon’s rehabilitation, or to help the other fourteen horses in the program. Use this link to access the PayPal donation link –http://tampatrot.org/how_you_can_help.html. Check out TROT on Facebook at https://www.facebook.com/tampatrot or visit their website at http://www.tampatrot.org. Last month I wrote at Equestrian Ink about Rapidan, a Thoroughbred gelding I had owned back when I was twenty or so. I referred readers to the “Rapidan” tag here at this blog so that they could read more about him. I just forgot that I never finished telling his story. And I probably left a lot out. So here is a little more of The Rapidan Story. What you have to remember about Rapidan is that I bought him a couple of weeks after he was gelded. At age five. He was skinny and he was mettlesome and he was looking for trouble, but I was already in love with his personality underneath all that tempestuous show of studliness. Within there was a bold, curious, good-humored horse who would make a hell of a jumper or eventer. Of course he would even out. I had him at a little barn where I was working at first, with a few other geldings, and he didn’t pose much problem. I didn’t have much time to ride him. My job was in its last death throes so my boss had me on the run twenty-four seven, trying to piss me off enough to quit. Anyone who has spent more than a month in the horse business knows exactly what I’m talking about. I finally quit a few weeks later. I was standing at a gas pump on a cold rainy night, and my door was open so that I could hear the NPR coverage of the presidential inauguration. I guess it was George W. Bush. I was much more interested in politics then. My cell phone rang and I answered it while I was still pumping gas. Another woman at the island got very angry and started yelling that I was going to start a fire so I climbed back into my Honda and turned down the radio. It was a breeding farm offering me a job as an apprentice. I’d never worked in breeding so the offer – which I believe was board for both my horses and a hundred bucks a week – was pretty attractive. Especially since I was ready to burn my boss’s house down at this point. And so I accepted the job and ended the call and wriggled a little in my seat, a little yay new job dance, and then I had to get back out into the cold and pump gas, and in Washington D.C. George W. Bush was president and I was about to take a two-months’ gelded teasing stallion to a breeding farm. What could go wrong? Who will win the Cheltenham Gold Cup this year? I’m sure it will be an exciting time betting at the 2013 Cheltenham Festival! I have my eye on Long Run, but that’s only because the former star and fan favorite, Kauto Star, who won the Gold Cup twice during his epic career as a champion National Hunt horse, is busy learning dressage! The big horse took the Gold Cup in 2007 and 2009, becoming the first horse to win the cup, lose the cup, and then win it back again. Just because they took steeplechasing out of eventing doesn’t mean we have to take stop taking eventers out of steeplechasing, and Kauto Star is proving to be no exception to that rule — like so many big bold Thoroughbreds before him, he’s learning to move in a new way, respond to his rider in new ways, and use all his bravery and style to get through a dressage round and, someday, get round a cross-country course. “He’s definitely taken to this challenge, willing to work with you and not against you,” says Collett. “When he’s worked something out, he doesn’t forget it. “What he’s found hardest and what’s going to take him longest is how to do a steady canter because he’s only ever known gallops. Although it’s no stretch to those of us who are Thoroughbred advocates to see a horse like Kauto Star as a successful sporthorse, there has been some backlash to the decision to keep him in work instead of kicking the horse out to pasture. I personally can’t imagine why anyone would want to waste the mind and talents of a sound, young gelding, but apparently not everyone shares my opinion. “Nobody has Kauto’s best interests more at heart than myself. Sounds like an ideal owner, to me. We need more of this attitude in racing, National Hunt or flat. If you want to keep up with Kauto Star’s daily life, Laura Collett has a great Twitter account, @colletteventing, where she posts pictures of horses she works with on a daily basis. Even if you don’t use Twitter, you can visit the link to see the pictures. I hope Kauto Star is the next Thoroughbred in a long line of poster children for what retired racehorses can do! You can’t hug a racehorse? Laurie Berglie is a frequent contributor to Retired Racehorse and also writes at her blog, The Sassy Grey. 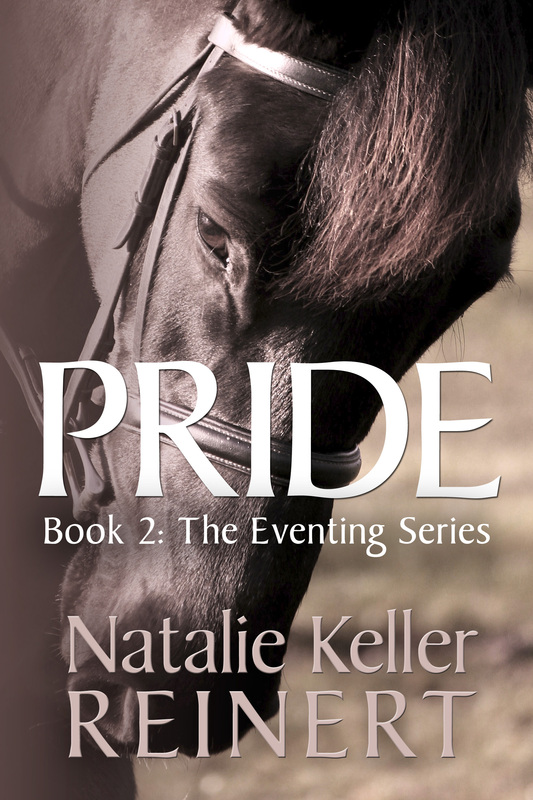 After reading Natalie Keller Reinert’s article, “You Can’t Hug a Thoroughbred,” I had to laugh! Of course I completely agreed with her that you could hug a racehorse, that you could, in fact, hug any horse. But after reading this, I was reminded of my own OTTB mare, Misty, and how, at first, I couldn’t hug her. So I’m not sure if it was my mother’s disapproval or just the sheer, raw beauty of the Thoroughbred, but I wanted one. (Also, it may have been Joanna Campbell’s Thoroughbred book series too – I was severely addicted to them as a child). Interestingly, however, until Misty I had never ridden a Thoroughbred. But then on a hot day in July of 2008, there was Misty, standing in a small paddock on my farm, having just been dropped off by her current trainer. I stared at her; she stared at me. What was I going to do with this horse? Oh well, I thought – let’s just get started. I began treating her like any other horse. I gave her some time to adjust to her new surroundings before I rode her, but I was there every day, grooming her, getting to know her. But I’ll never forget that first night. I was getting ready to leave and went into Misty’s stall one final time to say goodnight. I went to her side and hugged her, threw my right arm over her withers, my left arm around her chest, and laid my head on her shoulder – and she…turned around and tried to bite me! It wasn’t a serious effort – more of a “hands off lady!” nip at the air. I was shocked! So I leaned in to hug her again – same reaction! By this time, my mom was laughing as both mine and Misty’s expressions must have been priceless. But that’s what I did! Every night before I’d leave, I’d hug my Thoroughbred. She went from fake-biting at me to just tossing her head a little to full acceptance (or tolerance) of my affection. She has even hugged me back a few times. So can you hug a Thoroughbred? Absolutely. Can you hug a mare? Sometimes. In Classic Fashion was ready for his dressage career... and his first show. First-timers with OTTBs are often nervous, and with good reason. There’s an expectation that an OTTB will take one look at all those horse trailers, see the strange horses and people milling around, hear the loudspeakers, and make an educated guess: “Ah, a race!” and respond accordingly with lots of excited bouncing, piaffe-ing, possibly a little capriole-ing for good measure if they are feeling particularly athletic and competitive. You can’t blame them for it; in fact, if you’re particularly confident in your seat, you might be inclined to just laugh down at them. It is kind of cute, if it isn’t dangerous, all that rubber-ball-bouncing they like to do. Of course, they won’t all react like this. Some will fall off the trailer, pass out asleep hanging from their lead-rope while tied to the trailer, and rack up 45 time penalties while cantering around the cross-country course. But we should all be so lucky. Mine have always gone for the starting-gate routine, and that’s what I’ve learned to expect. I got a message last month from a rider who was looking for some advice after a particularly difficult first-show experience. It wasn’t just the show: it was everything, door to door. Julie wrote that she’s had her first OTTB for a year. 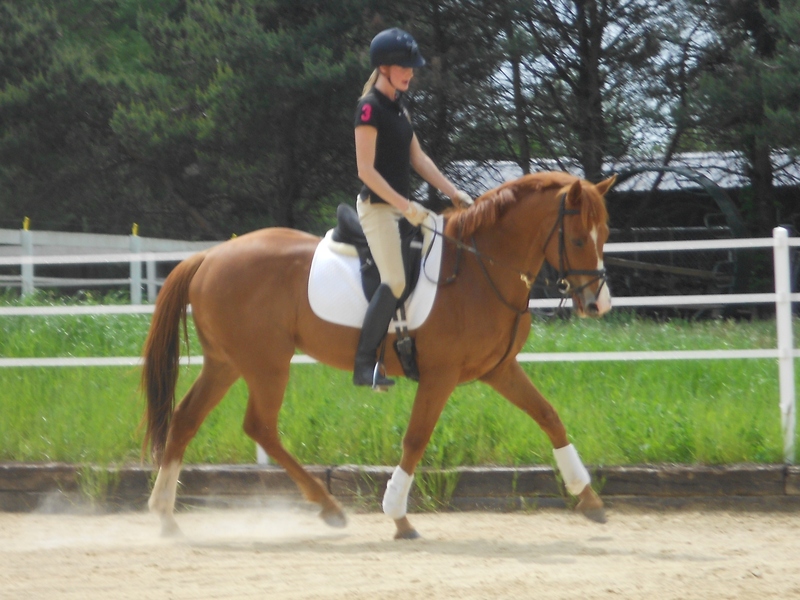 “He’s an awesome trail horse, learning dressage beautifully, and I love him.” Julie’s been around horses her whole life, but Calvin was her first jump from trail riding and stock horses to dressage training and Thoroughbreds. “I felt confident due to having started a lot of babies from scratch,” she mentions. Nothing like babies to give you a solid seat! A sweet trail horse and an adorable dressage horse. 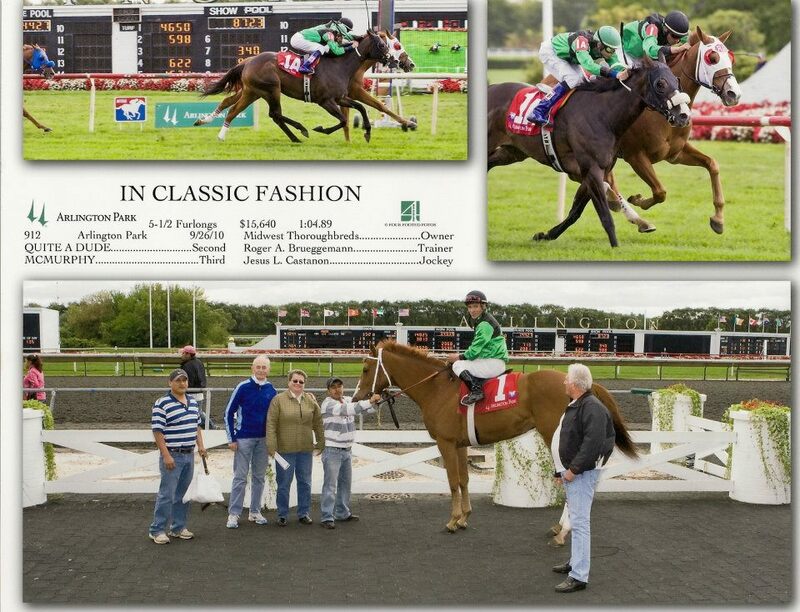 She found an OTTB with a nice little record: 25 starts, 6 wins, 4 places, and 5 shows, with earnings of $88,885, and a passport stamped by Presque Isle Downs, Colonial Downs, Laurel Park, Gulfstream, Churchill Downs, and Arlington. “Calvin was on a lay-up farm after bowing in the fall of his 6-year-old year. My trainer recently told me that normally two greenies don’t make a good match, but that Calvin and I make it work and that he’s taught me so much. Since he has no clue what I’m asking, if I don’t learn to ask correctly, we’re not going to get it right! At times I’ve felt intimidated, in over my head, and my patience tested. But when I get it right he rewards me with relaxation, beauty, and a glow on my face that lasts for days! Finally, Julie decided to take Calvin to an open show to introduce him to the atmosphere. “Unfortunately, the trailer ride was a solo ride, we were in stand still traffic due to a very smokey fire, passing motorcyle rally, etc. He came off the trailer upset! Then the venue had a car show going on and was actually very loud (they had blasting speakers over the horse stall area!) Needless to say he was beside himself. Phew! What bad luck for Calvin! I suggested a nice quiet outing with lots of walking around for his next off-farm experience, if not his next two or three off-farm experiences. Relaxing in the warm-up ring, at last! 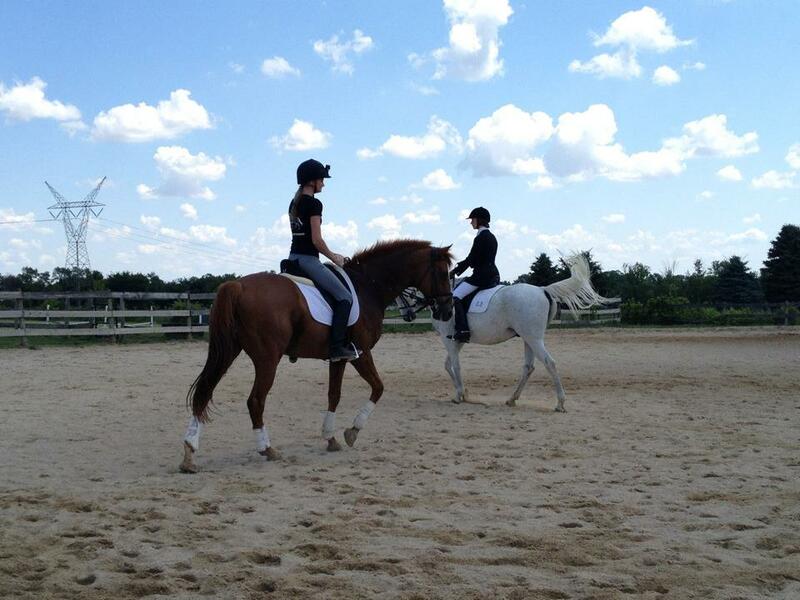 “The dressage schooling show was a much better experience! I gave him SmartCalm paste to take the edge off. We trailered without incident and arrived to a beautiful and calm environment. We lunged in the indoor by ourselves to get acquainted to the venue and then headed out to the warm-up ring. “He began jigging and whinnying. So I started by just walking him in hand around, and around, and around until he calmed. We did many, many halts and often times backing because he was walking on me or refusing to halt. Almost an hour of that and he calmed enough to get on his back. Then my trainer hand walked him with me on…yes very embarrassing to be a 34-year-old woman being lead-lined at a dressage show! What we do to train our beloved OTTB’s! What a great experience to counter the first one! It was great to hear how Julie worked slowly with Calvin and helped him chill out enough to do a little work in the arena. Thanks so much Julie, and best of luck to you and In Classic Fashion! I hope we hear from you again in the future. 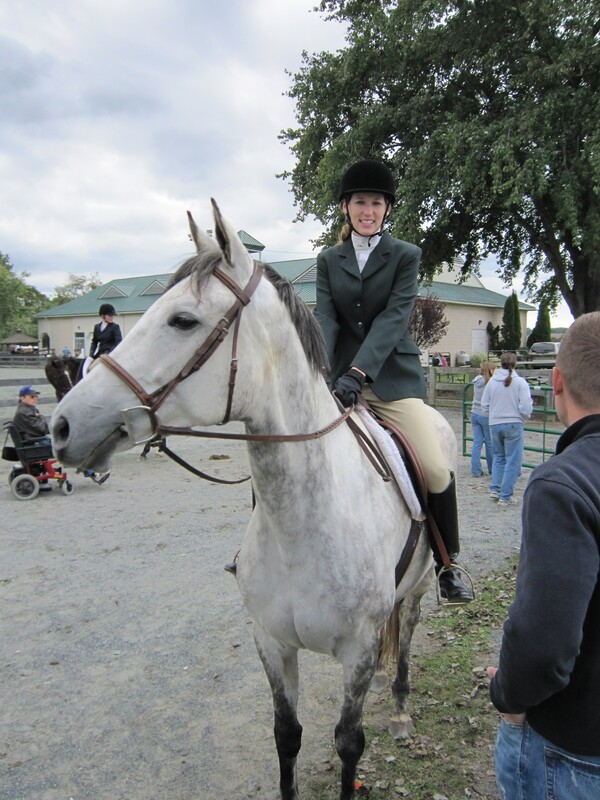 Rider Laurie Berglie writes about horses at her blog, The Sassy Grey, and is also the Baltimore Horse Examiner for Examiner.com. She last wrote at Retired Racehorse about her OTTB mare, Misty Mystique, in The Diva That is Misty Mystique. Although I’ve ridden for most of my life, I wasn’t very active in the show ring. I entered my first show with my Mustang pony at age 12 and subsequently competed about once a year in local hunter shows or 4H until age 17. At the time, we didn’t have a horse trailer, so coordinating hauling efforts were difficult. However, during those 6 or 7 shows, I amassed a small wall of ribbons and some low-level competition experience. Then came college… and marriage… and graduate school… and then Misty Mystique. I was 25 when Misty, a feisty mare fresh off the track, entered my life. At the time, I didn’t know much about the ways of the OTTB, but I read like a maniac and asked questions to anyone who would help. Before I knew it, Misty was going nicely and I tentatively wrote the date of our first show on the calendar. This was fall of 2010, which meant 11 years had passed since I had set a foot or hoof in the show ring. But I loaded up my Misty and off we went. The show I had chosen to enter was pretty low key, but there was still a substantial amount of commotion, noise, and general hustle and bustle. As soon as Misty heard the announcer over the loud speakers, she went into full racehorse mode. My friend was walking her around and Misty leaned her head into Kelsey’s arm, curved her neck, and did that sideways jig that racehorses will do alongside their lead ponies. However, after only 10 minutes of semi-confusion and snorting, Misty completely relaxed. As she watched the youth English riders hack around the ring, you could literally see the light bulb going off. OH! This is different! With Misty fully tacked and me outfitted in my show attire, I was given a leg up and walked into the warm up ring. Now, according to my friends and family in attendance, two things were glaring obvious at this point. I looked like a ridiculous ball of nerves and Misty… didn’t. She walked around with her head high, taking everything in, but she wasn’t silly or hot or out of control. She definitely looked like the green horse she was, but we were totally fine as we completed our walk/trot class. In the end, our class was pretty large so we didn’t place, but that didn’t matter. The entire day had been a success, a genuinely good experience for both of us. Kelsey commented later how impressed she had been because, “Misty really took care of you out there.” And she had. I had practically shook with nerves while my green OTTB had been as steady as a rock. And that is worth all the blue ribbons in the world.